– My friend Jonathan is in Florida, beginning his book tour. His first novel, Precious Blood, just came out. – Ruby is also in Florida, on my dream vacation. I’m very jealous. She’s kayaking on some swampy river somewhere. – Rachel just had a baby boy named Ezra. – Marisa and I want to a sample sale yesterday. – Howard is finishing up a million books, and not one of them will have a monkey on the cover, thank God. – Marianne’s birthday is tomorrow. She is 1,202 years old. And teeny. – Charles was in West Virginia, but I’m not sure where he is now. Connecticut, maybe? – Chris has a teenage son living with her. – Oh. I got an invite to an ITP event that looks fun. ITP is the Interactive Telecommunications Program at NYU where I went to grad school. 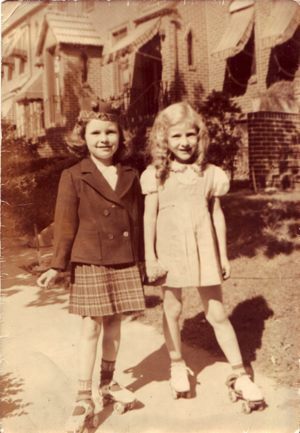 – That’s my mother and a friend, taken on East 28th Street in Brooklyn, sometime in the early 40’s, I’m guessing.